Here you can find all info about AK from Spliff Seeds. If you are searching for information about AK from Spliff Seeds, check out our Basic Infos, Gallery, Degustation, Strain Reviews, Shop-Finder and Price Comparison, Lineage / Genealogy, Hybrids / Crossbreeds, User Comments or Threads for this cannabis variety here at this page and follow the links to get even more information - or list all AK Strains (±112) to find a different version. If you have any personal experiences with growing or consuming this cannabis variety, please use the upload links to add them to the database! AK is a mostly indica variety from Spliff Seeds and can be cultivated indoors (where the plants will need a flowering time of ±56 days) and outdoors. 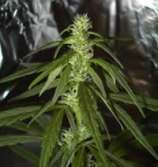 Spliff Seeds' AK is/was also available as feminized seeds. We used an AK as a mother and crossed her with our Northern Lights Special (90% Indica), which has ridiculous trichome production, as a father to improve THC production. The result is our AK that is Indica dominant (70%). She is a very quick finisher. AK performs well on hydro, coco or soil and is excellent for the SOG method. Very mould resistant, AK is one of the most stable varieties we have, producing uniform plants. She is very easy to grow, virtually idiot proof, as she can stand both higher and lower temperatures. AK doesn’t require a lot of nutrients. She does need some space in between individual plants to reach her full potential. Vegetative period is 3 to 4 weeks. Prune the lower buds to create one major bud or supercrop if you have space. AK is ferociously quick flowering variety. The rockhard buds are covered in red hairs and lots of trichomes. The aroma is a pungent, spicy smell resembling of noblewood. The taste is spicy and sweet. AK is amongst the most potent strains known to man. She has a bodystoned high with a good head buzz. Medicinal value: pms, muscle pain, joint pain, neuropathic pain, ms, insomnia, and depression. Genotype: (Colombian Gold x Highland Thai x Mexican x Afghani #1) x NL Special. Incense aroma and spicy, sweet flavour. Produces uniform plants. Very stable. Bodystoned high with a good head buzz. Where to buy AK cannabis seeds? AK from Spliff Seeds is available as regular and feminized seeds. In 8 seedbanks, we found 25 offers between USD 3.65 for 1 regular seed and USD 200.01 for 30 feminized seeds. If you are looking to buy AK Cannabis Seeds from Spliff Seeds somewhere - have a look to our AK Price Comparison page with all current offers from all the connected seedbanks and shops - or visit one of the following tested, trustworthy and recommended seed-shops directly to check out their current AK offers: Spliff Seeds, Herbies Head Shop, Discreet Seeds, Indras Planet GmbH, Green Parrot Seed Store, Samenwahl.com, Zamnesia and Cannapot Hanfshop. We've collected strain info from one grower for AK. AK gets 7.67 of 10 possible Points in the average! The seedfinder users tested AK and uploaded information about the aroma and effects of Spliff Seeds' AK. Here a short overview, click to the charts or links to get an exact description and find similar cannabis varieties! Here you see the latest AK photos, uploaded from our users! Altogether we've collected 1 pictures from Spliff Seeds' AK, check out our AK gallery to view them all. Click to show all parents of AK in our dynamic family tree map. Altogether we've collected 1 user comment about Spliff Seeds' AK. Unluckily not one of this comments is in english! To read them anyway, please click on one of the following links: german (1). Do you know something more about Spliff Seeds' AK? Please help to make this database better and upload/connect your information here! Pictures speak louder than words! Upload your "AK" Photos here and help other growers to get a better impression of this variety. You have grown AK together with another variety? Please fill out our Strain VS. Strain direct comparisation form! Our strain reviews are multilingual, searchable and can be very detailed - including data about the grow, aroma, effects and taste! Please upload your AK Review here to help the other seedfinder users! You have experience with the medical qualities of AK? Sharing your information here maybe can help other people! You've stumbled upon a AK related thread into a forum or growers community? Connect it here and enable othe users to find this information fast and easy! You found a related video with additional information or grow-infos about AK on YouTube? Please connect it here to the strain info page!